Arsenal manager Unai Emery has started Carl Jenkinson for tonight’s Premier League game against Bournemouth in a somewhat surprise move. The forgotten right-back has been out on loan and barely featured for the Gunners in recent seasons, last starting a league game for the north Londoners back in 2016 against Manchester United. It remains to be seen if this will prove a bit of a crazy gamble from Emery, who has also brought Mesut Ozil in to his starting XI in a move that is likely to be more warmly welcomed by fans. Pierre-Emerick Aubameyang gets the nod up front over Alexandre Lacazette, despite Emery often playing the two up front together this season. Arsenal urgently need a win today to continue their fight for fourth place in the Premier League this season. 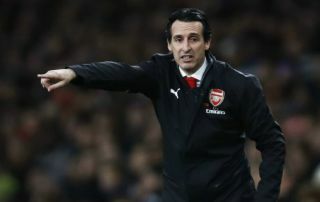 The north Londoners have been too inconsistent for much of this campaign and face stiff competition from Chelsea and Manchester United in the race for the final Champions League spot.